Hillary Clinton has taken some well-earned lumps for her caution on marriage equality and other issues. Clinton is an inherently cautious politician, but then again, if you were targeted by right-wing nutburgers (and a certain presidential candidate) who alleged you murdered a friend and were a secret lesbian, well, you might be a little gun-shy yourself. Add to this the fact that the mainstream media often mistake covering Clinton with target practice, and you’ve got the makings of a candidate who thinks twice about everything. But let’s give credit where it’s due. Despite her occasional missteps, Clinton has on the whole been more than just a reliable supporter. She has actually gone out of her way to push the envelope on our behalf. That’s much more true than it is for her spouse, although Hillary gets dinged for what Bill did. But judging a wife by her husband is so mid-century (or, to be blunt, sexist). Let’s judge Hillary by her own actions. Here are six times when she really went out of her way to show she means it when she says she’s got our backs. This may have been Clinton’s finest hour. It’s certainly her most underrated. She established a policy for the U.S. government that was a major step forward for international rights. In a powerful speech in 2011, Clinton eloquently demanded that the U.N. recognize our equality worldwide. “Like being a woman, like being a racial religious tribal or ethnic minority, being LGBT does not make you less human,” Clinton said. “And that is why gay rights are Human Rights and Human Rights are gay rights.” To her credit, Clinton’s commitment didn’t stop at the speech. Under her tenure, the State Department pressured countries like Honduras to protect its LGBT citizens and launched the Global Equality Fund to promote rights groups in other repressive countries. Unlike her opponent, who would be happy to let Vladimir Putin do whatever he wants, no matter how evil, Clinton has taken a tough line on Russia’s repressive policies, particularly when it comes to the gay community. “What Putin’s doing in Russia with all these laws against the LGBT community… is just a cynical political ploy,” Clinton has said, adding that as Secretary of State she got into “shouting matches” with top Russian officials. No wonder that Putin has thrown the weight of the Russian media behind Trump. In a touching show of her humanity, Clinton responded to a post from a frightened gay kid. “I’m homosexual, and I’m afraid about what my future will be and that people won’t like me,” he said. Clinton (and not her staff) penned a response: “Prediction from a grown-up: Your future is going to be amazing. You will surprise yourself with what you’re capable of and the incredible things you go on to do. Find the people who love and believe in you — there will be lots of them.” It was showed the warm side that her friends value but the public rarely sees. Clinton is obviously trying to wrap herself in President Obama’s mantle, so it makes sense for her to show her support in prominent displays. After all, that will be one of Obama’s most enduring legacies. Still, Clinton is trying to do Obama one better, at least in terms of visibility. But from the speakers at the convention to the people in her ads, Clinton has made a point of our inclusivity as a core part of her idea of what America is today. Those messages and visuals resonate well beyond the campaign; they set the bar for the culture as well. This must have made for some interesting conversations at home: while Bill Clinton was still in the White House, Hillary pledged to do her best to repeal Don’t Ask, Don’t Tell. She was running for Senate in New York at the time, and separating herself from her husband made political sense. But she went further than she had to, by declaring her husband’s compromise policy a failure six years after it was implemented and before the Democrats as a party saw fit to take a stand. A politician marching in a pride parade? Not so much a big deal, right? But in 2000, Clinton became the first First Lady to march in a Pride Parade. 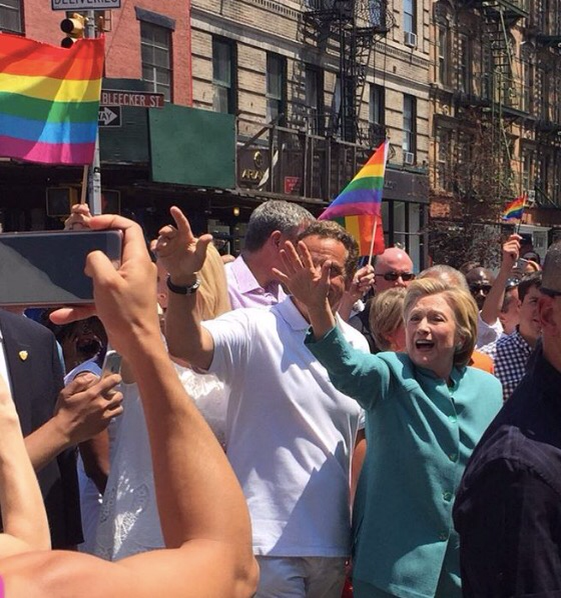 This year she became the first major presidential candidate to march in a Pride Parade (sorry, Barack). Plus, she sure looked like she was having a blast doing it. I’m still congested and had quite a headache last night. I watched what I could of the DNC, which I think has been going much better than the RNC last week. Last night was a tearjerker at times, especially when the mother of an Orlando victim spoke. I really enjoyed when the stars of Broadway sang “What the World Needs Now Is Love.” It was particularly nice to see Cagney and Lacey together again. All in all, it was a powerful night at the convention. I also want to say, the night before Bill Clinton gave a wonderful speech. It was classic Clinton, and I don’t think anyone else could have put such a human face on Hillary and be able to give her history like he did. The speech made Hillary real like nothing else could have done. I’m so glad I got Isabella. She’s such a wonderful companion. She stays right next to me almost all the time and follows me around. She may not snuggle but she is still a good companion. I really wish she would stop biting my toes at night. It makes it terribly difficult to sleep. The funny thing is her fascination with her own tail. Edith, my cat back in Alabama, doesn’t have a tail, and she is very self-conscious about it. She gets upset when you point out that she has no tail, but Isabella is different. She constantly chases her own tail. She will chase it all over the bed, but she rarely catches it. When she does catch it she doesn’t know what to do with it. 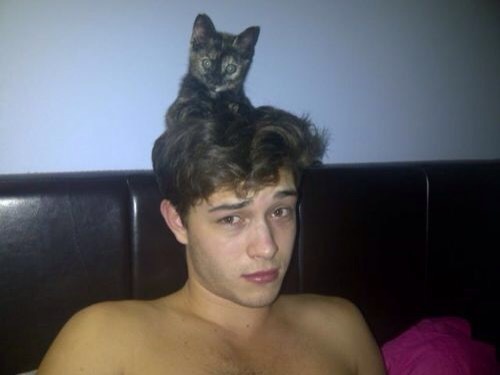 Kittens are such funny little creatures. Joseph O. Legaspi was born in the Philippines, where he lived before immigrating to Los Angeles with his family at age twelve. He received a BA from Loyola Marymount University and an MFA from New York University’s Creative Writing Program. Legaspi is the author of Imago (CavanKerry Press, 2007), winner of a Global Filipino Literary Award. He is the recipient of a 2001 poetry fellowship from the New York Foundation for the Arts, and in 2004 he cofounded Kundiman, a nonprofit organization serving Asian American poetry. He works at Columbia University and lives in New York City. I have to take my car in to be serviced today. My air conditioner has died, my tires need to be serviced, and my oil needs to be changed. I hate going to a mechanic. Everyone I’ve ever dealt with when servicing my car always tried to get me to spend more money than necessary, and sadly, I don’t know enough about cars to know the difference. Luckily, I have found a garage up here that is well trusted. It’s actually owned by a woman, and from all accounts, she never tries to cheat her customers. She did great work last time I took my car to her, so I’m hoping the same will be true this time. It’s nice that this place is giving me a loaner car for the day. Just when I thought I was getting well, my fever returned last night. It’s one of the things that has helped with this cold. Last night, I felt awful. I was running a 100.9 degree fever. If I’m still running a fever this morning, there is no way I’m going to work. At least my nose has quit running so bad once I was able to lay down. However, my head was hurting along with body aches from the fever. I hope the medicine I took kicks in and by the time this posts, and I will be feeling better.